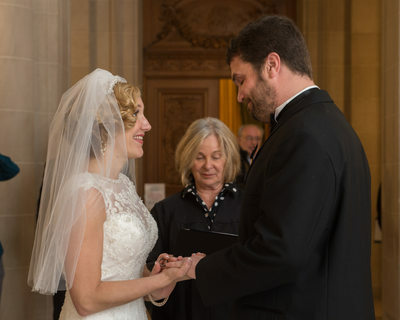 Krista and Tate recited their wedding vows just after the New Year of 2017. 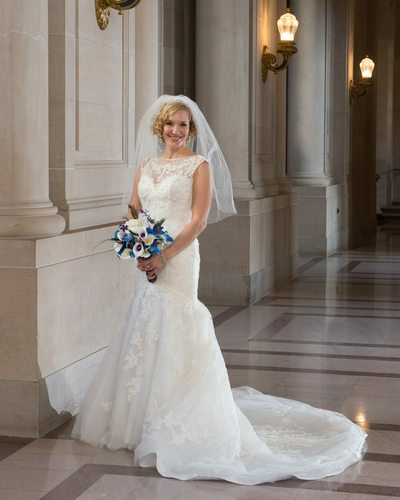 We loved their formal attire, especially Krista's wedding dress, complete with a long veil and train. She also brought a colorful bouquet which really looked fantastic. We strongly recommend bringing flowers to all of our wedding couples. As beautiful as San Francisco City Hall is, it's not very colorful. Lots of grays and whites because of all of the marble and other neutral materials. A little splash of color does wonders for the photos! I invite you to take a detailed gander at the images in this gallery and you will see evidence of what I am describing. 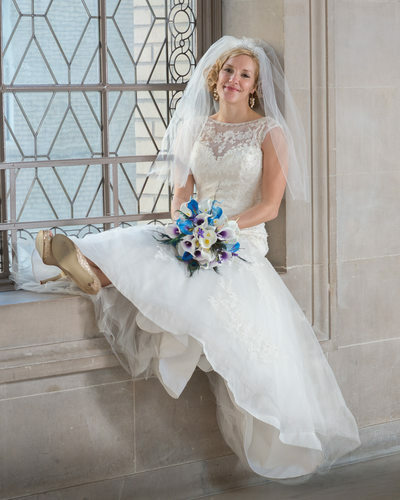 Please note how the color of the bouquet adds just enough color to the image without distracting the eye. 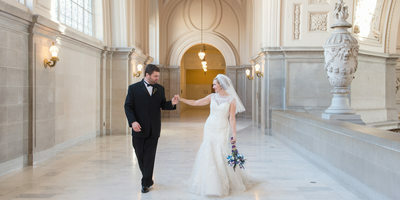 Krista and Tate booked our City Hall PLUS package which includes 1.5 hours of photography time and includes check-in coverage plus pre-wedding photos. 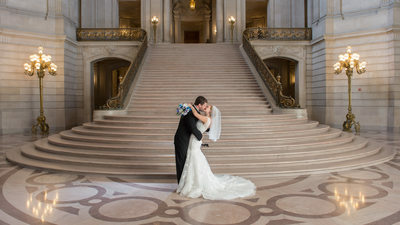 This is our most popular package and it really is for the couple who wants the full San Francisco City Hall treatment. 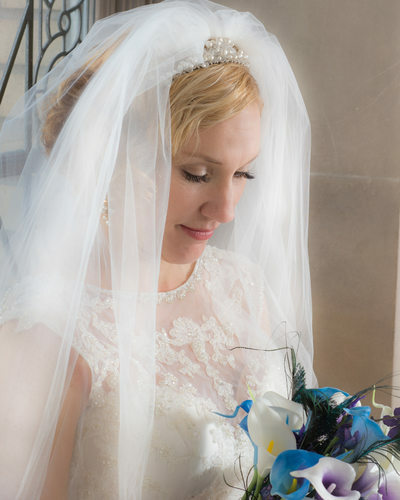 Professional wedding photography from start to finish, covering all of the memorable moments, laughter and tears. If you want to go off-site destination in San Francisco then you will need to look at either our Golden Gate Package or our San Francisco Package. 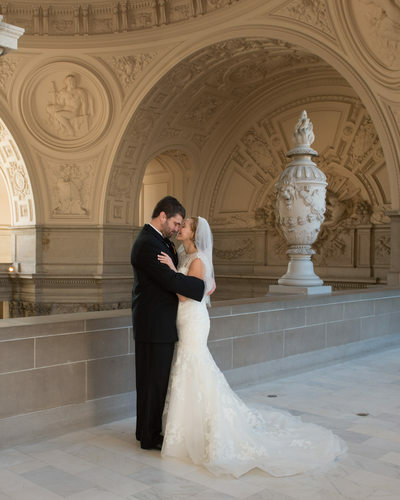 These packages include pleasant transportation to the San Francisco Locations of your choice and when we arrive we take gorgeous photos of the bride and groom. 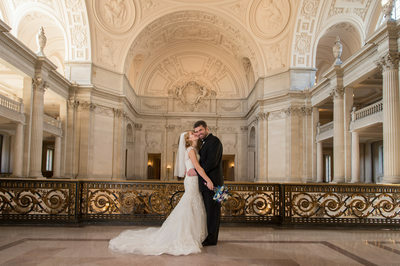 The other nice thing about the City Hall PLUS package is that it allows 30 extra minutes for family and friend photos. 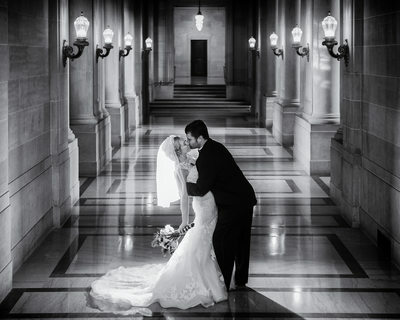 We are more than happy to provide you with memorable photos of all of your guests. We normally take these right after the ceremony is completed. This works well because you have all of the guests right there and available. Some of the best memories I have of my wedding is seeing all of my family and guests pictures and also noting the changes over the years. I think spending this extra time is well worth it to capture these important memories. 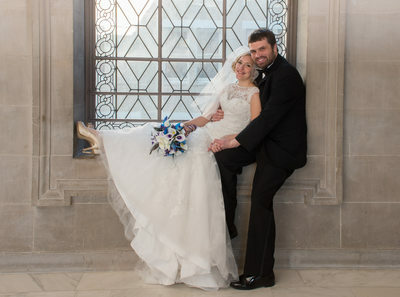 We really need that extra time to ensure that after the family portraits are complete, there is still time for formal photos of the newlyweds. So think about making a complete listing of all of the combinations of family groups you want. I often suggest that our brides and grooms also consult with their parents to help compile this photo list. Once the family photos were complete, we escorted Krista and Tate around the building to make some great memories in pictures. We were fortunate that the Grand Staircase was quite empty (as you can see in the photos above). 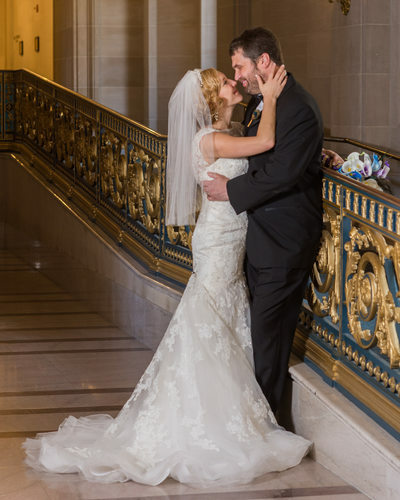 In fact, most of the photos of San Francisco city hall on this day were not displaying too many tourists or other recently married couples with their photographers. 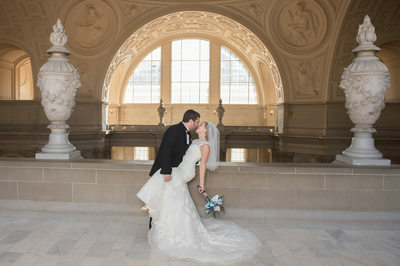 We took this great looking couple to all of our favorite destinations and we were able to acquire multiple images. As is our usual Modus Operandi we stayed in constant communication with our newlyweds to make sure we were obtaining the images they were looking for, but also to keep the mood light and fun. We find that if we smile and are happy throughout the shoot, it helps our couples relax and pose better for their wedding pictures. It makes such a difference in the final quality of the images and is well worth the effort. What words do I hear more frequently from our clients then almost anything else? "We want lots of candid photos!" Of course they do so how do we accomplish this? 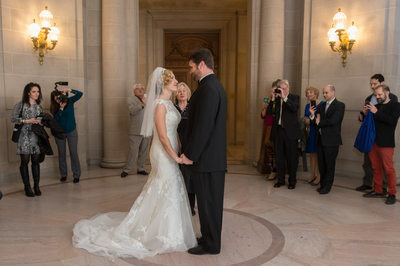 To be honest, San Francisco City Hall weddings do not possess as many candid moments as a regular full scale Saturday wedding. 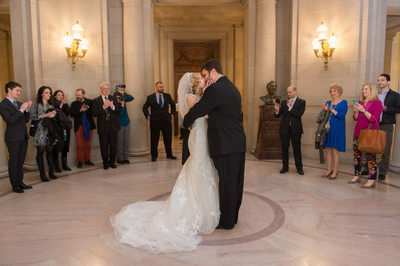 Many of the events present at a typical wedding do not occur at city hall. For example, there is no first dance and usually no Cake Cutting. Providing the newlyweds with activities is really how you create documentary wedding photography. Does this mean we can't get candids at city hall? Certainly not! We just need to try a little harder and create some of the moments and see what transpires. 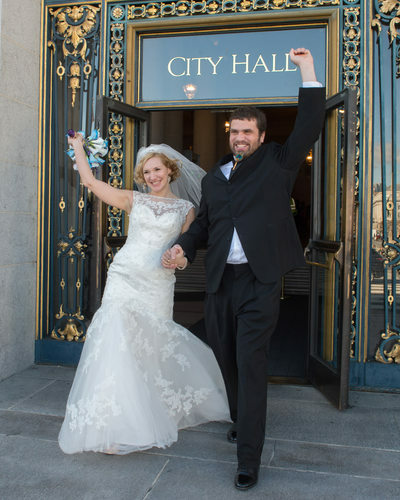 Listed below are some of our best ideas to provide our city hall newlyweds with some nice candid images to treasure for a lifetime. I have also included the moments that do NOT need to be created, but just occur anyway over the course of the city hall wedding session. Return to San Francisco Home Page. 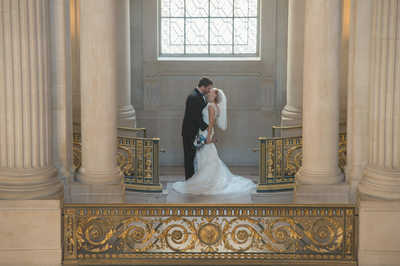 To check out more city hall galleries, click the link.